« HMNY – the profit-investment nexus: Keynes or Marx? The leading Keynesian bloggers have been discussing the causes of inequality again. 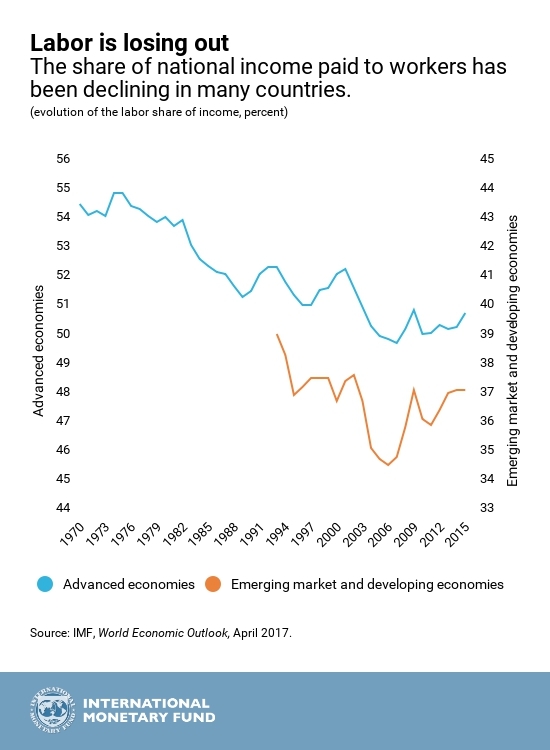 In particular, they have highlighted the apparent decline in labour’s share of national income in most advanced capitalist economies since the early 1980s. According to an ILO report, in 16 developed economies, labour took a 75% share of national income in the mid-1970s, but this dropped to 65% in the years just before the economic crisis. It rose in 2008 and 2009 – but only because national income itself shrank in those years – before resuming its downward course. Even in China, where wages have tripled over the past decade, workers’ share of the national income has gone down. As Keynesian blogger Noah Smith put in an article, “For decades, macroeconomic models assumed that labor and capital took home roughly constant portions of output — labor got just a bit less than two-thirds of the pie, capital slightly more than one-third. Nowadays it’s more like 60-40.” What has happened? Smith reckons that there are four possible explanations: 1) China, 2) robots, 3) monopolies and 4) landlords. By China, he means that globalisation and the shift of manufacturing by multi-nationals to so-called emerging economies has led to labour in advanced economies losing jobs and seeing their wages stagnate while productivity has risen. Yet, as Smith points out, labour’s share has fallen in China too and (until recently) inequality of income rose sharply. Then there is the accelerating substitution of machines for workers, particularly with robots and artificial intelligence. What appears to be happening is that more efficient, hi-tech firms are growing fast, leaving behind inefficient firms that use more labour. These less efficient firms lose market share and so start to employ less workers as well. It used to be argued in mainstream economics that inequalities were the result of different skills in the workforce and the share going to labour was dependent on the race between workers improving their skills and education and introduction of machines to replace past skills. Indeed, another leading Keynesian Brad Delong still supports this answer. In a recent post, he suggests that Smith and Krugman have it wrong. “let me suggest that there is no mystery to explain.” If we look at labour’s share of net GDP, i.e. after deducting depreciation (the amount of output needed to replace worn-out plant and equipment), then labour’s ratio has not really fallen, except during the Great Recession. So Delong concludes that any redistribution of income was indeed within labour’s share from low earners to high earners (CEOs, top executives, doctors and dentists etc) and not between labour and capital. Delong’s argument is not convincing. First, depreciation may not be defined as profit but it is clearly a deduction from gross profits. Second, even the graph above does show a trend decline in labour share after its sharp rise in the late 1960s, which led to an intensification in the fall in profitability in most advanced capitalist economies from the mid-1960s and in an accompanying class struggle. The decline was also significant from 2000 during the credit-boom in the US (unlike Europe, where labour’s share was steady and even rose in the Great Recession – the opposite of the US experience). And third, the gains in income for CEOs and small business doctors, dentists, lawyers and other ‘professionals’ are really profits not wages. See Simon Mohun’s excellent work in this regard. This is not new in Marxist economic theory. Marx put it differently to the mainstream. Investment under capitalism takes place for profit only, not to raise output or productivity as such. If profit cannot be sufficiently raised through more labour hours (ie.e more workers and longer hours) or by intensifying efforts (speed and efficiency – time and motion), then the productivity of labour can only be increased by better technology. So, in Marxist terms, the organic composition of capital (the amount of machinery and plant relative to the number of workers) will rise secularly. Workers can fight to keep as much of the new value that they have created as part of their ‘compensation’ but capitalism will only invest for growth if that share does not rise so much that it causes profitability to decline. So capitalist accumulation implies a falling share to labour over time or what Marx would call a rising rate of exploitation (or surplus value). And yes, it does all depend on the class struggle between labour and capital over the appropriation of the value created by the productivity of labour. And clearly labour has been losing that battle, particularly in recent decades, under the pressure of anti-trade union laws, ending of employment protection and tenure, the reduction of benefits, a growing reserve army of unemployed and underemployed and through the globalisation of manufacturing. What Krugman seems to be suggesting is that it is an imperfection in the market economy that creates this inequality and if we root out this imperfection (monopoly) all will correct itself. So Krugman presents the issue in the terms of neoclassical economics. But it is not monopoly rule as such, but the rule of capital. Sure, capital accumulates through increased centralisation and concentration of the means of production in the hands of a few. This ensures that the value created by labour is appropriated by capital and that the share going to the 99% is minimised. This is not monopoly as an imperfection of perfect competition, as Krugman explains it; it is the monopoly of ownership of the means of production by a few. This is the straight forward functioning of capitalism, warts and all. The falling share going to labour in national income began at just the point when US corporate profitability was at an all-time low in the deep recession of the early 1980s. Capitalism had to restore profitability. It did so partly by raising the rate of surplus value through sacking workers, stopping wage increases and phasing out benefits and pensions. Indeed, it is significant that the collapse in labour’s share intensified after 1997 when US profitability again peaked and began to slide again. The IMF graph above shows that this applied to most economies. 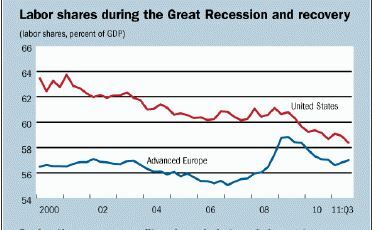 Labour’s share in the capitalist sector in the US and other major capitalist economies is down because of increased technology and ‘capital bias’, from globalisation and cheap labour abroad; from the destruction of trade unions; from the creation of a larger reserve army of labour (unemployed and underemployed); and from ending of work benefits and secured tenure contracts etc. 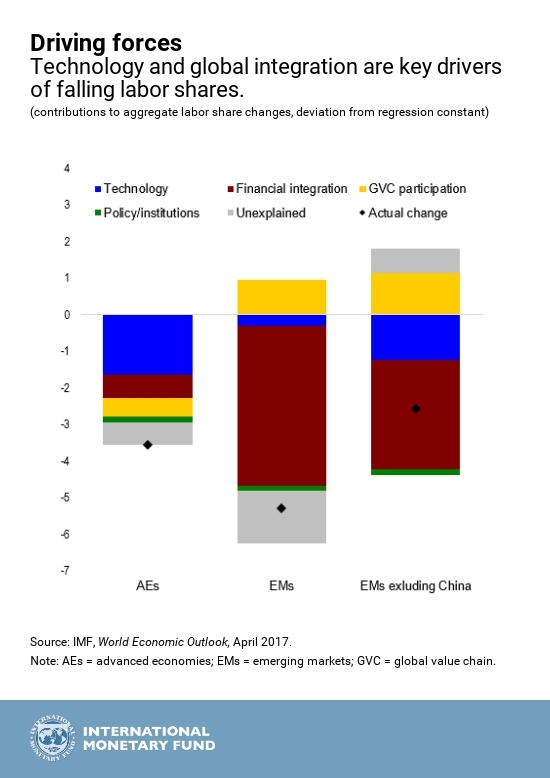 Indeed, this seems to be the conclusion reached by the IMF in its latest report, Chapter 3 of the April 2017 World Economic Outlook finds that this trend is driven by rapid progress in technology and global integration. Maybe ‘capital bias’ and ‘globalisation’ had less of an effect on labour share in the US because of the greater growth in financial profits and rents there than in the rest of the advanced economies. This entry was posted on April 30, 2017 at 6:37 am and is filed under capitalism, economics, marxism, Profitability. You can follow any responses to this entry through the RSS 2.0 feed. You can leave a response, or trackback from your own site. Great site on art history you have Mr Humphries – learnt a lot. Surprised and pleased to find that my art hero van Gogh sympathised with utopian socialism and was not just religious. And to learn about the views and approach of Seurat and Signac. Actually, that was the argument put by Ricardo, and Marx argues against it, specifically in relation to agriculture. Ricardo, argued that if a farmer has £1,000 to invest, and doing so would mean that the rate of profit on this investment fell below their current rate of profit – which he also assumes to be the average rate of profit – then the farmer would not invest the £1,000. Marx, in Theories of Surplus Value, shows that this is wrong. The farmer may not invest the capital in a new farm, Marx says, because for one thing that would involve them in paying additional rent, but they may well invest it in their existing farm, where this additional investment will entail no additional rent. They will do so, Marx says, because even if it does not produce the same rate of profit, or the average rate of profit, it will produce an additional mass of profit, which otherwise they would not have. The farmer may not be able to invest the £1,000 in some other line of business that produce a higher rate of profit, for many reasons. £1,000 may be below the minimum capital requirement to invest in some other business; they may know nothing about furniture production; the other type of business may only be possible in some distant town or city, which would distract them from their main business of operating a farm, and so on. The only other option, Marx says, is that they could use the £1,000 as money-capital, and throw it into the money market to earn interest, but, Marx says, they are unlikely to do that, because the rate of interest is much less than the rate of profit, and so the return they would be likely to get as interest is likely to be even lower than the reduced rate of profit they get from investing it in their existing farm. The same is true of every other industry. Competition drives capital to search out additional profit, not necessarily a higher rate of profit for each additional investment. That notion belonged to Ricardo, not Marx. Well, strip my gears and call me shiftless. am I actually agreeing with Boffy regarding Michaels statement:. “Workers can fight to keep as much of the new value that they have created as part of their ‘compensation’ but capitalism will only invest for growth if that share does not rise so much that it causes profitability to decline. ” ????? I don’t know. Worries me, but not that much. Anyway– workers fighting for “keeping as much of the new value” might just as well cause capitalists to invest more, not less in order to reduce unit costs, increase production, lower prices, and redistribute surplus value to one or more capitalist’s advantage. Rising wages do not automatically trigger “investment strikes,” nor do they immediately and automatically bring about declines in profitability. We need only look at the 1948-1969 period in the US; or the 1992-2000 period, or the decline of nominal wages, but the rise in real wages, and the rise in capital investment during the misnomer called the Long Depression, which was in reality the long deflation. As for the rest of what Boffy has to say, meaning his second post, Boffy reverts to type. More on that later. Yankees going for the sweep against the Orioles. But, that is not what Marx discusses as the basis of the rising organic composition of capital. In Capital III, Chapter 6, he makes it quite clear that the proportion of both fixed capital and of labour in the value of the final output declines, whereas it is the value of the circulating constant capital that increases, and provides the basis for the rise in the organic composition of capital, and provides thereby the basis for the rate of profit to fall. And Marx points out that, the rise in productivity is itself a consequence of improvements in technology so that one new machine replaces two or more older machines, so that not only the value, but the physical quantity of machines may fall either absolutely, but definitely proportionally. If a spinning machine of 9 spindles is replaced by new machines with 36 spindles, essentially one new machine replaces four older machines. Yet, the price of this one new machine with 36 spindles may be less that the price of one of the older machines with 9 spindles let alone the price of four of the older machines. But, where one of the older machines may have spun 900 kilos of cotton into yarn, the new machine spins 3600 kilos of cotton into yarn, and thereby one machine minder now processes 4 times as much material as previously they did with the older machine. It is the fact that, even if this new machine has the same value as one of the older machines, it transfers only a quarter as much value to a kilo of yarn, as previously one of the older machines did, and also that only a quarter as much new labour is transferred to a kilo of yarn as was previously the case. By contrast, the value of cotton per kilo of yarn remains the same (unless the rise in productivity has also reduced cotton prices) so that relative to fixed capital and labour, the proportion of material rises substantially, which thereby brings about the rise in the organic composition of capital, and fall in the rate of profit/profit margin. The effect on the annual rate of profit, and thereby the general annual rate of profit, is of course, different than the effect on the rate of profit/profit margin, because the substantially raised quantity of output per day, means that the working period is reduced by 75%, which brings about a rise in the rate of turnover of capital, with a subsequent rise in the annual rate of profit. Could you explain that further? I guess what I am asking is for you to flesh out the distinction a bit more. I’m not sure I see it. Funny how the inequality and social injustice just started to disturb these keynesians when started to reach the germanic-saxon countries. Data showing declining labour’s share of GDP dramatically underestimate the real extent of the phenomenon, because the super-wages and even the realised share options of CEOs etc are counted towards labour’s share – these people are not part of the working class at all – and because of sharply rising wage inequality among workers. But there is a much bigger problem with not just the data but the very concept of labour’s share of GDP. A large part of the GDP of imperialist countries is not generated domestically in those countries, it is generated in low-wage countries and captured by firms HQ’d in imperialist countries. Or do we agree with the bourgeois economists that GDP does indeed measure domestically-generated production? And the price-value conflation upon which this doctrine rests? How can any Marxist discussion of labour’s share ignore this issue? Gross domestic product is defined as the monetary value of all goods and services produced within a country’s borders in a specified period of time. Price is, as Marx described it, the value of a commodity expressed in money terms. 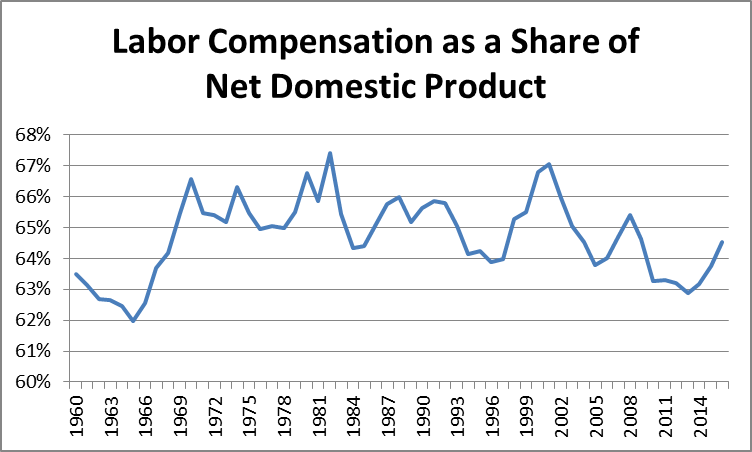 So yes, it’s very useful to talk about the “labor share” in describing TRENDS in the economy. Why Mr. Smith himself does this in his book on imperialism, describing the tremendous decline in the “labor share” over the last 30 years or so. It would be helpful if John could show how in fact a large part of the GDP of imperialist countries is not generated domestically. I do not think that tee shirts produced in Bangladesh sold to a retailer in an advanced country for $1.20 and resold in the advanced country by that retailer $12 amounts to GDP being generated outside the advanced country’s borders. That is no more the case with tee shirts than it is the case for oil, or imported from Saudi Arabia, or Canada, or Iraq and then utilized for production or transportation services in an advanced country means that the production or transport services are not really elements of the GDP of the advanced country. …Therefore transportation, warehousing, and retailing costs add more than 10 times the value of the actual product produced by labor earning less than10 percent of the wage of a super-exploited Amazon fork lift driver or a Walmart super-exploited food stamp “associate”–both employing equipment no more costly or sophisticated than the actual producer…That sounds a bit like… Boffy, the neoliberal Marxist. The share is dramatically understated for other reasons. In Capital II and III, Marx discusses Adam Smith’s “absurd dogma” that the value of commodities, and, therefore, the value of national output/GDP can be resolved in revenues (wages, profits, rent and interest) or (v + s), whereas, as Marx has demonstrated, it can only be resolved into revenue and capital, that is into c + v + s.
The value of c, the raw and auxiliary materials, and wear and tear of fixed capital are not accounted for in the national accounts data, because, as Marx demonstrates, this value does not enter (in aggregate) into circulation, and creates a revenue for no one, it is, as Marx puts it only an exchange of capital with capital. It is capital that is replaced on a physical “like for like” basis out of current production, in the same way that a farmer replaces his seeds out of his current year’s production of grain, so that this portion of his output is never sold, and creates no consumable revenue for him. The use value is replaced on this “like for like basis”, as a physical replacement as Marx puts it in Capital III, and its value is thereby determined by its current reproduction cost, the labour-time required currently for that reproduction, which depends on whether social productivity has risen, fallen or remained the same. The followers of Adam Smith’s absurd dogma, effectively use Smith’s excuse that the value of the constant capital itself resolves into revenues, which Marx shows at length, particularly in TOSV, is impossible because each element of constant capital itself consists of c + v + s, and not just of v + s. They point to so called “intermediate production”, i.e. the value of all that production that goes into the final product, but Marx demonstrates that this is not “constant capital”, in value terms either. In his schemas of reproduction in Capital II, he demonstrates that this “intermediate production” itself, in value terms consists only of new value created by labour during that year. In other words the c, “intermediate production”, used in Department II, is only equal to Department I (v +s). All of the huge and growing mass of Department I (c) that is simply reproduced on a “like for like” basis within Department I, i.e. an exchange of capital with capital, forms revenue for no one. And because it forms an income for no one, it is not accounted for in any National Income data. That is why Marx shows that National Income cannot be equal to the value of National Output, as Adam Smith and economists down to today insist. The value of National Income and the value of output included in GDP data is only the value of the final consumable product, or as Marx puts it the value of the consumption fund. 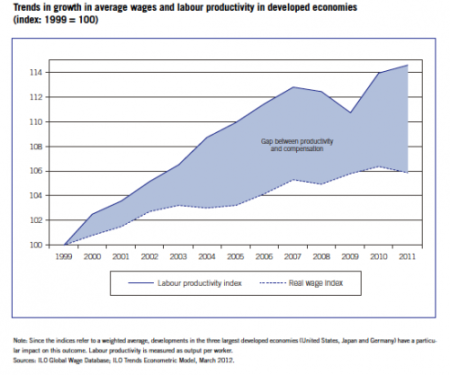 As a result the share of labour is automatically understated as a proportion of the total output value. This is the importance of Marx’s comment I referred to earlier about the real basis of the rise in the organic composition of capital being the increase in the mass of circulating capital as a proportion of the value of commodities, and thereby of the national product, being the basis of the rise in the organic composition of capital, and thereby of the basis for the tendency for the rate of profit to fall. But, the value of labour in the national accounts data is understated for a further reason, which is that the data is based upon the capital laid out, rather than the capital advanced to production. If the rate of turnover of capital is 10, let’s say, then the capital advanced as wages is only a tenth of the figure of wages laid out during the year. In other words, the workers are paid wages for 5 weeks, but in that period they produce the commodities that are sold, and thereby return to capital the value of the wages they have advanced. The capitalist then only advances again, the same capital they advanced for the first five weeks, or put another way, the workers have produced the variable capital, with which they are then paid in the next five weeks, and each five week turnover period after that. In fact, Engels showed in Capital III that the rate of turnover of capital even by the middle of the 19th century, in Britain was around 8, and rises in productivity mean that it has increased many times since then. Its probably more like 50 today, as an average figure, though it varies greatly from industry to industry. In other words, the actual share of labour as advanced variable capital should be taken as about a fiftieth of what the national accounts data shows, and as Marx then argues the real general annual rate of profit on the advanced capital rather than the laid out capital, which only gives the profit margin, is much, much greater. And, as Marx sets out in Capital III, and in TOSV the real rate of profit the general annual rate of profit depends not just on the organic composition of capital, but on the rate of turnover, as this determines the prices of production in each sphere. Those spheres with a higher organic composition of capital than the average, have prices of production higher than their exchange value, and vice versa, whilst those capitals that have higher rates of turnover of capital than the average have lower prices of production than their exchange values. In a global economy that has implications for the movement of surplus value from one economy to another. Generally, the more advanced economies with higher organic compositions of capital will have higher rates of capital turnover, and their general annual rate of profit is thereby higher than less developed economies, even though, as Marx demonstrated wages are higher in these more developed economies than in less developed economies. That is why, in general, the export of capital has been mostly from one developed economy to another developed economy, rather than from developed economies to less developed economies. In Marx’s terms, workers are far more exploited in developed economies than they are in less developed economies, even though their living standards in the former are much higher. I just noted the obvious error, here, that wherever I said that the figure for labour was “understated”, it should have read “overstated”, because the figure for constant capital in the value of total output is grossly understated. Obvious error is that Boffy is confusing share of the wealth with share of production of wealth. And even there Boffy has it all wrong. Pick an industry, almost any industry, and look at the labor-time required for output, as a portion of output, today vs. 2001, or 1991, or 1981. You can do this at home boys and girls. It’s so easy even a grown-up can do it. You can it for railroads, maritime transport, natural gas production, oil, coal, semi-conductors, etc etc etc. The other point, to be made is that, as Marx says, there is a world of difference between the Marxian theory of the falling rate of profit and the Malthusian/Smithian/Ricardian theory of the falling rate of profit, which is based upon a notion of a falling rate of surplus value, and even falling mass of profit. In other words, a profits squeeze. This latter phenomenon, is, however, what Marx discusses in Chapters 6 and 15 of Capital III, where he talks about the available labour supplies being used up as capital is accumulated, and wages to rise to a point where additional capital does not produce any additional surplus value, and may even cause the mass of surplus value to fall, i.e. overproduction of capital. That as he says is quite different to the Marxian theory of the tendency for the rate of profit to fall, which is based upon a rising rate of surplus, and rising masses of profit, along with it. And, as Marx sets out in that Chapter as against the catastrophist theories of Malthus and Ricardo, this rise in the rate of surplus value goes along with a rise in workers living standards, precisely because it is based upon constantly rising productivity, which reduces the value of wage goods, so that even constant nominal wages, or even falling nominal wages, buy increasing amounts of use values. That is why the higher levels of exploitation, in the Marxist sense, occur in the more developed economies, NOT in the less developed economies. The rising living standard is merely the other side of the coin to the rise in productivity, which causes a given amount of labour to process increasing quantities of material, constant capital, so that the organic composition of capital rises. And, in this rebuttal of Ricardo et al, Marx also does in the idea put forward by the temporal Single System Interpretation, about there only being one system of prices, based upon prices of production. In Capital III, in setting out the historical development of prices of production and an average rate of profit, Marx shows that when capitalist production commences, capital flows first into those areas with low organic compositions, where surplus profits can be made. As more and more capital flows into these areas, the supply of these commodities rise, pushing down market prices until the surplus profit is eroded, and the commodity then sells at its price of production, Capital then invades some other area of production. He goes on to show that even non-capitalist producers thereby also sell at prices that are no longer exchange values, because the outputs of capitalist producers are simultaneously inputs for other non-capitalist commodity producers, so these producers input costs are no longer determined by their exchange value, and consequently their output prices are also modified. Its why Engels talks about exchange value no longer being determinant after capitalist production starts in the 15th century. In dealing with the question again in TOSV, marx comes back to this idea when talking about rent. Competition would always eventually drive down market prices to the price of production, wherever surplus profits exist, provided capital can freely enter that line of production. In agriculture it can’t, because landed property will only allow capital to engage in production if it pays an absolute rent. The basis of the absolute rent is the difference between the market value of output, and the price of production, i.e. the surplus profit. Consequently, as marx says, agricultural products do not sell at their price of production, but at their exchange value. Otherwise, they would not produce surplus profits and rent would be impossible. So, we have at least three different systems of pricing co-existing with each other according to Marx. We have mature capitalist products, which sell at prices of production; we have non-capitalist production, which sells at modified exchange values, and this applies also to all of that new capitalist production where where capital accumulation has not yet reached a level whereby competition has absorbed surplus profits; and we have capitalist production of agricultural commodities, and mineral production et al, where landed property acts to prevent the surplus profit being competed away, and so products sell at their exchange values, again modified to the extent that their inputs are sold to them at prices of production. One final point. Marx’s argument against Ricardo is that Ricardo recognised that the rise in productivity, constantly reduces the value of industrially produced wage goods, which thereby raises the rate of surplus value, but Ricardo believed the fall in the rate of profit could thereby be explained only by the rise in food prices being more than enough to countervail than, and that it also led to rising rents, which also ate into profits. Marx shows that catastrophist argument is wrong too. The price of food also falls as a result of rising capitalist productivity. The fall in the rate of profit is not due to the mass of profit falling, but to it rising along with the rise in productivity, as a given amount of labour processes a larger and larger mass of material. Living standards more or less constantly rise, but workers share in the new value they produce falls, because the rate of surplus value rises. It is this very rise in the rate of surplus value due to higher productivity which causes the fall in the rate of profit, because the total value of materials processed rises even if not in line with the increase in its volume. That is the point made by Marx in the quote I gave previously from Cap III, Chapter 6. However, not only is there no reason why that rise in productivity should not reduce the unit value of materials by a greater proportion than their proportional rise in volume, but also in an economy like that of today, where 80% of value creation, and surplus value creation occurs in service industries, where very little material is processed as part of that value creation, the argument brakes down. In a sense its a bit like mineral production and mining, where as Marx says, there is virtually no processing of material, because the processing is actually the production of the material itself, which is then processed by others. Consequently, where the economy is so heavily dominated by labour intensive value creation, as service industry is, not only does Marx’s point above about new labour intensive production apply, but it somewhat makes the basis of the law of the tendency for the rate of profit to fall, outdated. It can only operate where rising productivity causes larger and larger amounts of material (circulating constant capital) to be processed by a given amount of labour. And, for this vast and dominating sector of the economy, that simply no longer applies. NB. In relation to the above, when Marx refers to “cost-price” throughout Theories of Surplus Value, he means “Price of Production”, as defined in Capital III, and not cost-price, as would normally be considered, as c + v.
…I neglected to add that the disparity in wages could not hold within a single country, unless through the use of force (i.e. against an underclass based on race or foreign nationality as in the United States). It is maintained internationally through direct and threatened military aggression. Super-exploited foreign labor is in fact an underclass within a single economic global order that is falling apart because its success requires an attack on labor at the imperial center, which is awakening into long dormant class consciousness (a concept neoliberal Marxists, like Donald Trump (pace Boffy), seem to view as competition between skilled workers in developed and unskilled workers in the underdeveloped world. Should The labour share % of annual output be weigthed by number of working people, so as to reduce the % if the number of people working happens to be higher? If the average wage is higher, that also may mean that the number of working people has to be lowering. a. We have an increase in the organic composition of capital which leads to a decrease in the rate of profit. b. If we look at the Net Domestic Product, we see that every year, capitalists extract 40% of the labor value out of workers. This can only increase the debt of the workers that need to buy the products they create. Both lead to economic crises. Inside capitalism, we cannot increase the labor share so as not to have a debt crisis because profits will fall. In fact, the opposite happens because each individual capitalist wants to extract more surplus value. So, both factors lead to economic crises that can only be avoided by removing profits as the reason for production. 1. An increase in the organic composition of capital does not necessarily lead to a fall in the rate of profit. It depends what happens to the rate of surplus value, and mass of surplus value, relative to the increase in the advanced capital. 2. Even if the rate of profit/profit margin falls, this is not the same thing as the general annual rate of profit falling, any more than the fact that Sainsbury’s might sell on much tighter profit margins than a small grocer, and yet makes both much larger volumes of profit, and a higher rate of profit. It all depends upon the volume of output, and the rate of turnover of capital. 3. Its not clear that the organic composition of capital is rising, for the reasons I have given above, i.e. 80% of modern economies consists of Service Industry production, which is labour intensive, often employs high value labour at one end, even if it employs unskilled labour at the other, and where increasing volumes of material being processed, does not really enter into the labour process. Even in terms of the use of fixed capital, which is where the high value end of Service Industry represents mineral extraction, the value of that fixed capital has been massively devalued, as a result of technological developments and rises in productivity. For example, the real terms cost of building office blocks has tumbled, even if the speculative prices of land has risen. The value of things like computer terminals has become almost de minimus compared to what it was even 30 years ago, and the cost of adding additional nodes to existing communications networks is also very low. 4. If capitalists only extract 40% of the new value created by labour each year, the system really is in crisis, and should have collapsed already. Marx and Engels showed that even in the 19th century, actual rates of surplus value ran at around 1300%, and the vast rises in productivity since then mean that figure has increased substantially. Moreover, the rise in productivity means the rate of turnover of capital is much greater than it was, so that the capital advanced is reduced substantially, or put another way, workers produce their own wages from their own production, to a far greater extent in each year, so that the capitalist has to advance less and less additional capital, for the increasing amounts of labour employed. 5. Workers living standards can rise substantially even if their nominal wages fall, and a larger proportion of their output is appropriated by capital. The value of the workers labour power is determined by the volume of use values they must consume. If a worker needs to consume 1 kilo of grain per week, to live, their money wage can fall in half, so long as this money wage still buys a kilo of grain. If what you say were correct, then the system would have collapsed more than century ago. The argument you have presented is the argument of Malthus and Ricardo, not Marx. On what Marx says is the basis for investment in fixed capital, as opposed to simply accumulation of circulating capital, its perhaps worth looking at what he actually said.